Yesterday the Malcolm family made the long drive to the Oregon Coast from Spokane. The drive seems to get even longer each time we take it! Having Tia & Maisy always add a few extra stops, but they love getting to go and see their Gramma & Grampa! I have a doggy “hammock” that goes in the back seat of my car so they can have their beds and toys. Keeps them fairly occupied because they usually nap too. This is our route, about 436 miles each way. 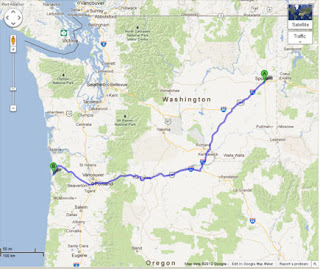 The worst stretch is from Spokane to the Tri Cities and then through the Columbia Gorge. It is boring! At least I know where ALL of the Starbucks are for pit stops. I hope that everyone has a wonderful day spending time with your loved ones and indulging yourselves in yummy food. I was originally going to run in a turkey trot this morning, but I decided to just run on my own. I love running on the beach and just wanted some quiet time. I also had an awful stomach ache this morning and wasn't sure how far I would be able to even run. Luckily I get in over 4 miles so I earned my dinner. I was going to be good and only have 1 dessert at dinner, but I had two. Oh well! How far did you have to travel for Thanksgiving? What is your favorite things to eat & indulge in on Thanksgiving? Are you running in a turkey trot?